The story of the church can be summed up in 4 words: “God’s Work, Our Witness”. This is true for every Christian church throughout all of history, including my very own FBC Baton Rouge. There are a number of ways that we can look at the longevity of FBC and attribute the effectiveness and endurance of this body of believers for nearly 140 years to the hard work and commitment of so many men and women of God; but that would not be the reason for why we are here today. The only explanation, and the foundational reason for our existence as a church family is that God has done a great work in us and through us for the glory of his name, and we are witnesses to his work in us. The truth is that the church is a picture of each individual’s Christian testimony. The story of the church is the story of her people. We’ve heard it said so many times “The church isn’t a place or building, the church is people.” That statement is true and we need to be reminded of it daily. But what makes the story of our church unique is that there are so many individual stories that make up the fabric of our collective witness. At the very heart of our witness is not what we have done, but what God has done to make us his people (1 Peter 2:10), sanctify our hearts (1 Thess. 5:23-24), and move to obedience for his glory (Romans 16:25-27). Christian, this is YOUR STORY! God has done a magnificent and glorious work in your life by saving you and making you his own child. This is a miracle that only a God of abundant grace and mercy could accomplish. You were once an alien to God, but now you are his very own child, marked by his Holy Spirit and called to a life of holiness and obedience. Paul’s testimony is just like yours and mine: “This is who I was before Jesus saved me, and this is who I am now because Jesus saved me.” That is our story. What is so amazing to me is that as differently and diversely as our individual stories can be told, essentially we are all telling the same story. And that common story is all for the glory of God. I am writing this to you because I want you to consider your own story. We are currently working on a project for our church family at FBC Baton Rouge that concerns every believer in our congregation. I’m not revealing to you just yet what it is (hope you like surprises! ), but I believe it will be a tremendous encouragement to each and every one of you. In the meantime, I need you to do something very important for me and for your brothers and sisters in Christ: Think about your testimony and write it down. 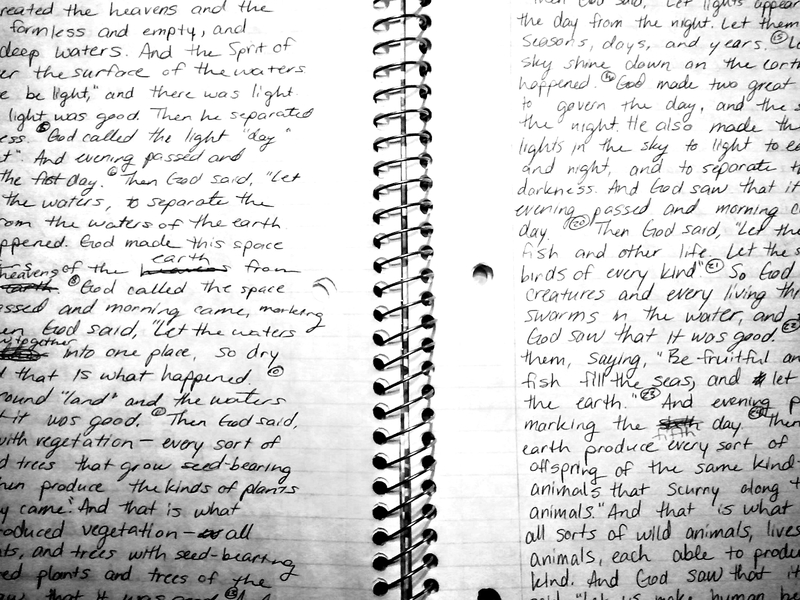 Take some time to think deeply and concisely about what you have witnessed what God has done your life and then write it down on 1 sheet of paper. For some of you this will be a difficult task because you like to include every detail. The details are important, but the challenge for each of you is to condense your testimony to 1 sheet of paper while making the entire testimony about what God has done to transform your life. I think the result for this effort will have a tremendous effect on our congregation as we seek to honor God by proclaiming his gospel. Please consider this challenge and accept it with joy. So we left off our last blog post with us being tired. Especially being tired of painting. But would you like to guess what we’ve been doing the past two days? If your answer is painting, then you’re right. Yesterday we spent almost all day at Aina Haina Baptist church, were some of us went for Easter Sunday. It’s a small church of about 25 (mostly older) people who are just as sweet as sweet can be. We helped them do three major things: one group trimmed up a bunch of plumeria clippings to get them small enough to fit into the dumpster, one group started painting a shed that was built up on stilts on a hillside, and one group went adventuring up on a vegetated, overgrown, rocky mountainside, following Pastor Gary and his chainsaw, to cut up some dead Hawaiian mesquite trees and hand the lumber back down the mountainside. It was quite a sight to see. Like every group here, they fed us a fantastic lunch, and after lunch we spent the afternoon with our favorite task–painting. Today the group got to go take a tour of Pearl Harbor and learn a little bit about American History and pay our respects to fallen servicemen and women. Around lunch time, we came back and helped serve at the BCM’s International Student lunch, which was a good opportunity to reach out to the students here. Then, this afternoon, you guessed it…more painting! Tomorrow night is CRASH, the BCM’s biggest outreach event. They expect over 100 students to show up, a huge portion of whom don’t attend most BCM things. And let me say, from all the time we’ve spent painting the fellowship hall here this week, this is going to be the best looking CRASH this place has seen. It really has made a significant difference, and it’s good to know how much everyone here appreciates it. 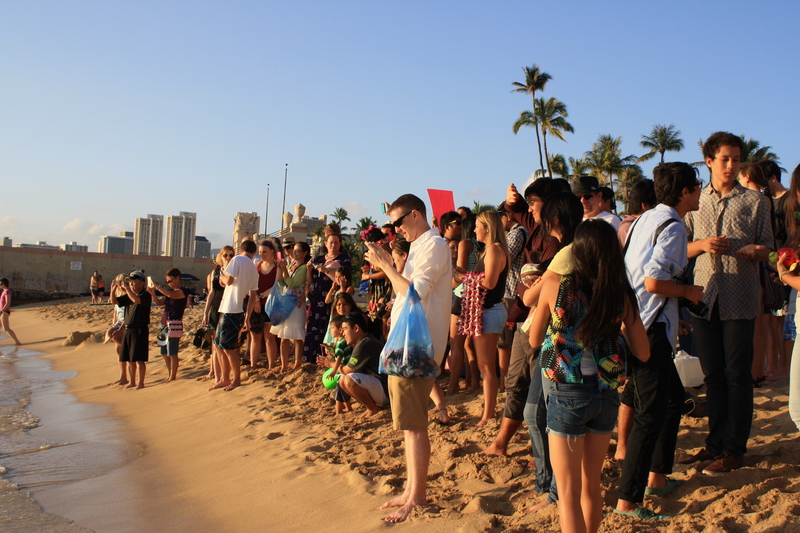 Finally, tonight, we got to experience the most wonderful of Hawaiian traditions: surfing! A few students took our group out to Waikiki and taught everyone who wanted to learn how to surf, which was definitely a fun and exciting experience. If any of you are taking a beach vacation and want some pointers on surfing, ask Larkin. He picked it up pretty quick and I’m sure he’d be happy to tell you all about it. Like I said earlier, tomorrow night is a big night for the BCM here. It’s when they have the most students come into a non-threatening, relaxed atmosphere, and it makes for a great place to be intentional in conversations about sharing the gospel. So be praying for that as you read this, that God can use this event to make His name known on the campus here and that people will be blessed by it. Apologies for being so late with this post. We’ve been extremely busy the past two days, staying out late, so I haven’t had the energy to write at the end of the day. But here’s a quick recap of what we’ve been up to. Monday morning we had two tasks: half the time we spent prayer walking around the University of Hawaii campus and reaching out to students to invite them to this week’s BCM events and the other half we spent wiping down all the dirt on the walls in the BCM in preparation for today’s painting. 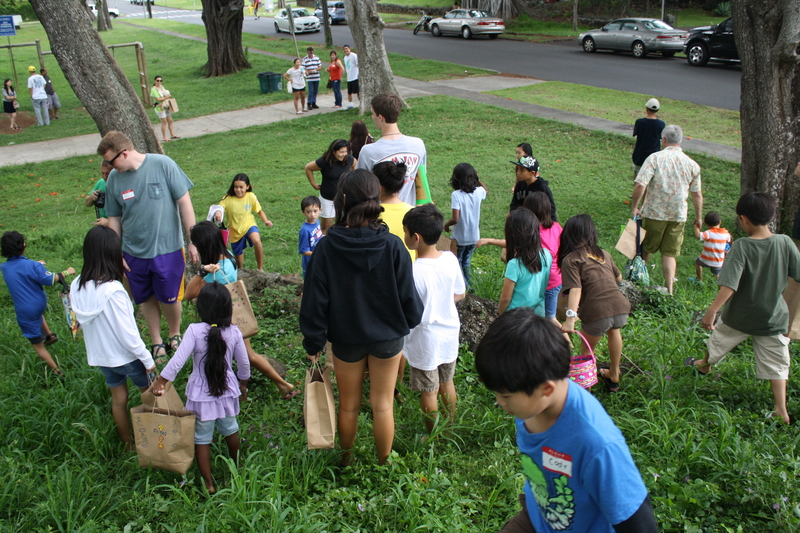 In the afternoon we went to Central Baptist Church here in Honolulu to help them with a youth outreach event. Central Baptist is located right across the corner from Roosevelt High School and just two blocks down from Stevenson Middle School, and the people of the (small) church have a heart for reaching out to the teenagers that are literally across the street. Unfortunately, the students just haven’t been very receptive, which is discouraging to Pastor Shane and his crew. We helped set up for the event and then once school let out most of our group went out on the sidewalks around the school and invited the students to come over to the church, where we were handing out free hot dogs and chips and drinks. Most of the students were skeptical and kept asking why we were just giving them free food, which led to a few good conversations about the church wanting to bless the students. I know it was an encouragement to the staff to have all of us there helping, so be in prayer for them that they can keep focused and persistent in their ministry and that God will use them to reach out to those two schools that are so desperately in need of Him. After our afternoon at Central Baptist, we spent the better part of our late afternoon/evening with some great team building, hiking the Koko Head trail. Koko Head is a peak on the southeastern part of Oahu that’s about 1200 ft high, and the trail up to it is just an old military outpost railway tram track that runs to the top. Which you get to climb like a staircase. A 1200 foot tall staircase. So it’s a pretty tough hike, but it was a great time for us all to bond through perseverance together. It makes for a great illustration of our faith journeys as well, but I’ll save that for another day. Today we painted. And painted. And painted some more. Then, after we finished painting, we kept painting. Or at least it felt like it. We painted the BCM’s kitchen, a good portion of their pantry/storeroom (which is about 3x the size of the kitchen), and their rec room/chapel/fellowship hall (which is about 6 times the size of their pantry). So, needless to say, we painted a lot. All the while, we found time to take all the screens off the windows in those rooms and wash the window slats and window screens, which get filthy from the volcanic ash that floats in from the big island. It may have been very menial work, but everyone has been so appreciative of it, because today we accomplished a bunch of small tasks that, all together, make the place look amazingly better. 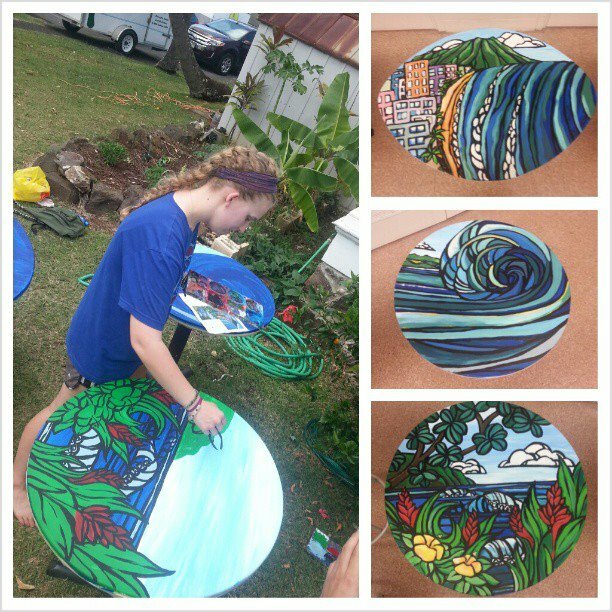 Also, Laura was able to take some hideous old faded baseball, basketball, and football shaped tables and paint some Hawaiian scenes on them to make them look completely new and so much better looking. The picture above is of them; I took it from the instagram of one of the students that lives in the BCM here. It’s the only pic I’ve gotten in the last two days because I haven’t had a chance to download from anyone’s camera. Anyway, to bring it all to a close tonight we had The Vine, which the BCM’s weekly worship service. There were about 60 people in all, and afterwards we all came back to the BCM and had dinner together. In his sermon tonight, Arjay talked about Luke 9:18-29 and being radically obedient to Christ’s call and how that looks in our lives. One of the things he talked about was how we’re called to live rightly even when we don’t feel like it, and I think that perfectly applied to our group yesterday and today. We’ve pretty much been going non stop and everyone has got to be exhausted (I know am) from all the work we’ve done, but even today when you could see everyone just being so tired of painting, we all fought through and kept working to get the job done. You should be proud of your students, FBC, they’ve done a great job so far. Tomorrow we go to Aina Haina Baptist to do some work clearing out dead trees and fixing up an unfinished shed. Plus whatever else they cook up for us to do between now and then. So pray for energy for us all that we don’t get too exhausted and that we can keep going.